Amazing. Very helpful and knowledgable. Private Mercedes van and driver for less than if we took the cruise ship bus tour. We did the WALK of the GODS. 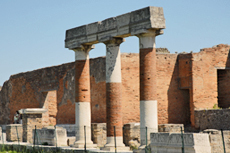 We used AP Tours to do a tour of the Amalfi coast and Herculaneum with guide. So glad we did this tour independently as the ship one was US$300 dearer. So glad we did this tour independently as the ship one was US$300 dearer. A great tour, wonderful scenery. Very good tour guide who was lighthearted, informative and very relaxed. The day just flew by. If you like art and food, take a walking and private car tour with Vesuvius Vs Pompeii Company. Wanted to see both Herculaneum and Pompeii and this was the way we could do both. Fabrizio Melanaragno was the tour guide and provided us with an amazing tour of the Amalfi coast. We booked a private tour which took us to Positano, Sorrento and Pompeii. Booked a pizza making course through Viator. Booked a pizza making course through Viator. Unfortunately the local tour operator neglected to tell Viator and us that the location was closed for summer vacation. Viator did refund us. Sorry, forgotten, but enjoyed it, and shopped in the port on return to ship. Sorry, forgotten, but enjoyed it, and shopped in the port on return to ship. Good quality stuff. Raphael from Limousinrome met us at the port for this day. We took a private tour with APT Tours arranged with a group from Cruise Critic. We ported in Salerno, not Naples (no option in Ports). We booked privately for a trip to Capri and this one was outstanding. We booked privately for a trip to Capri and this one was outstanding. We took the ferry over and were able to do all of Capri and Anacapri by private car and walking. In Naples we also booked a private tour. Excellent guide/driver. Climbed Mt. Etna. Explored Taormina. Must go back! Rome in Limo is the best company. Rome in Limo is the best company. We used them in Livorno, Rome and Naples. The best value. Cheaper than a ship excursion and small private groups. Very professional!